Latanoprost is a colorless to slightly yellow oil that is very soluble in acetonitrile and freely soluble in acetone, ethanol, ethyl acetate, isopropanol, methanol and octanol. It is practically insoluble in water. Latanoprost Ophthalmic Solution is supplied as a sterile, isotonic, buffered aqueous solution of latanoprost with a pH of approximately 6.7 and an osmolality of approximately 267 mOsmol/kg. Each mL of Latanoprost Ophthalmic Solution contains 50 micrograms of latanoprost. Benzalkonium chloride, 0.02% is added as a preservative. The inactive ingredients are: sodium chloride, sodium dihydrogen phosphate monohydrate, disodium hydrogen phosphate anhydrous and water for injection. One drop contains approximately 1.5 Î¼g of latanoprost. Absorption: Latanoprost is absorbed through the cornea where the isopropyl ester prodrug is hydrolyzed to the acid form to become biologically active. Studies in man indicate that the peak concentration in the aqueous humor is reached about two hours after topical administration. Distribution: The distribution volume in humans is 0.16 ± 0.02 L/kg. The acid of latanoprost can be measured in aqueous humor during the first 4 hours, and in plasma only during the first hour after local administration. 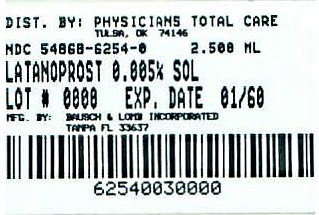 Metabolism: Latanoprost, an isopropyl ester prodrug, is hydrolyzed by esterases in the cornea to the biologically active acid. The active acid of latanoprost reaching the systemic circulation is primarily metabolized by the liver to the 1,2-dinor and 1,2,3,4-tetranor metabolites via fatty acid Î²-oxidation. Excretion: The elimination of the acid of latanoprost from human plasma is rapid (t1/2=17 min) after both intravenous and topical administration. Systemic clearance is approximately 7 mL/min/kg. Following hepatic Î²-oxidation, the metabolites are mainly eliminated via the kidneys. Approximately 88% and 98% of the administered dose is recovered in the urine after topical and intravenous dosing, respectively. In monkeys, latanoprost has been shown to induce increased pigmentation of the iris. The mechanism of increased pigmentation seems to be stimulation of melanin production in melanocytes of the iris, with no proliferative changes observed. The change in iris color may be permanent. Ocular administration of latanoprost at a dose of 6 Î¼g/eye/day (4 times the daily human dose) to cynomolgus monkeys has also been shown to induce increased palpebral fissure. This effect was reversible upon discontinuation of the drug. Latanoprost Ophthalmic Solution is indicated for the reduction of elevated intraocular pressure in patients with open-angle glaucoma or ocular hypertension. Patients with mean baseline intraocular pressure of 24 â€“ 25 mmHg who were treated for 6 months in multi-center, randomized, controlled trials demonstrated 6 â€“8 mmHg reductions in intraocular pressure. This IOP reduction with Latanoprost Ophthalmic Solution 0.005% dosed once daily was equivalent to the effect of timolol 0.5% dosed twice daily. Results showed that the onset of noticeable increased iris pigmentation occurred within the first year of treatment for the majority of the patients who developed noticeable increased iris pigmentation. Patients continued to show signs of increasing iris pigmentation throughout the five years of the study. Observation of increased iris pigmentation did not affect the incidence, nature or severity of adverse events (other than increased iris pigmentation) recorded in the study. IOP reduction was similar regardless of the development of increased iris pigmentation during the study. Latanoprost Ophthalmic Solution has been reported to cause changes to pigmented tissues. The most frequently reported changes have been increased pigmentation of the iris, periorbital tissue (eyelid) and eyelashes, and growth of eyelashes. Pigmentation is expected to increase as long as Latanoprost Ophthalmic Solution is administered. After discontinuation of Latanoprost Ophthalmic Solution, pigmentation of the iris is likely to be permanent while pigmentation of the periorbital tissue and eyelash changes have been reported to be reversible in some patients. Patients who receive treatment should be informed of the possibility of increased pigmentation. The effects of increased pigmentation beyond 5 years are not known. Latanoprost Ophthalmic Solution may gradually increase the pigmentation of the iris. The eye color change is due to increased melanin content in the stromal melanocytes of the iris rather than to an increase in the number of melanocytes. This change may not be noticeable for several months to years (see WARNINGS). Typically, the brown pigmentation around the pupil spreads concentrically towards the periphery of the iris and the entire iris or parts of the iris become more brownish. Neither nevi nor freckles of the iris appear to be affected by treatment. While treatment with Latanoprost Ophthalmic Solution can be continued in patients who develop noticeably increased iris pigmentation, these patients should be examined regularly. During clinical trials, the increase in brown iris pigment has not been shown to progress further upon discontinuation of treatment, but the resultant color change may be permanent. Eyelid skin darkening, which may be reversible, has been reported in association with the use of Latanoprost Ophthalmic Solution (see WARNINGS). Latanoprost Ophthalmic Solution may gradually change eyelashes and vellus hair in the treated eye; these changes include increased length, thickness, pigmentation, the number of lashes or hairs, and misdirected growth of eyelashes. Eyelash changes are usually reversible upon discontinuation of treatment. Latanoprost Ophthalmic Solution should be used with caution in patients with a history of intraocular inflammation (iritis/uveitis) and should generally not be used in patients with active intraocular inflammation. Macular edema, including cystoid macular edema, has been reported during treatment with Latanoprost Ophthalmic Solution. These reports have mainly occurred in aphakic patients, in pseudophakic patients with a torn posterior lens capsule, or in patients with known risk factors for macular edema. Latanoprost Ophthalmic Solution should be used with caution in patients who do not have an intact posterior capsule or who have known risk factors for macular edema. There is limited experience with Latanoprost Ophthalmic Solution in the treatment of angle closure, inflammatory or neovascular glaucoma. There have been reports of bacterial keratitis associated with the use of multiple-dose containers of topical ophthalmic products. These containers had been inadvertently contaminated by patients who, in most cases, had a concurrent corneal disease or a disruption of the ocular epithelial surface (see PRECAUTIONS, Information for patients). Contact lenses should be removed prior to the administration of Latanoprost Ophthalmic Solution, and may be reinserted 15 minutes after administration (see PRECAUTIONS, Information for patients). (see WARNINGS and PRECAUTIONS): Patients should be advised about the potential for increased brown pigmentation of the iris, which may be permanent. Patients should also be informed about the possibility of eyelid skin darkening, which may be reversible after discontinuation of Latanoprost Ophthalmic Solution. Patients should also be informed of the possibility of eyelash and vellus hair changes in the treated eye during treatment with Latanoprost Ophthalmic Solution. These changes may result in a disparity between eyes in length, thickness, pigmentation, number of eyelashes or vellus hairs, and/or direction of eyelash growth. Eyelash changes are usually reversible upon discontinuation of treatment. Patients also should be advised that if they develop an intercurrent ocular condition (e.g., trauma, or infection) or have ocular surgery, they should immediately seek their physicianâ€™s advice concerning the continued use of the multiple-dose container. Patients should be advised that if they develop any ocular reactions, particularly conjunctivitis and lid reactions, they should immediately seek their physicianâ€™s advice. Patients should also be advised that Latanoprost Ophthalmic Solution contains benzalkonium chloride, which may be absorbed by contact lenses. Contact lenses should be removed prior to administration of the solution. Lenses may be reinserted 15 minutes following administration of Latanoprost Ophthalmic Solution. In vitro studies have shown that precipitation occurs when eye drops containing thimerosal are mixed with Latanoprost Ophthalmic Solution. If such drugs are used they should be administered at least five (5) minutes apart. Latanoprost was not mutagenic in bacteria, in mouse lymphoma or in mouse micronucleus tests. Chromosome aberrations were observed in vitro with human lymphocytes. Latanoprost was not carcinogenic in either mice or rats when administered by oral gavage at doses of up to 170 Î¼g/kg/day (approximately 2,800 times the recommended maximum human dose) for up to 20 and 24 months, respectively. Additional in vitro and in vivo studies on unscheduled DNA synthesis in rats were negative. Latanoprost has not been found to have any effect on male or female fertility in animal studies. Reproduction studies have been performed in rats and rabbits. In rabbits an incidence of 4 of 16 dams had no viable fetuses at a dose that was approximately 80 times the maximum human dose, and the highest nonembryocidal dose in rabbits was approximately 15 times the maximum human dose. There are no adequate and well-controlled studies in pregnant women. Latanoprost Ophthalmic Solution should be used during pregnancy only if the potential benefit justifies the potential risk to the fetus. Eyelash changes (increased length, thickness, pigmentation, and number of lashes); eyelid skin darkening; intraocular inflammation (iritis/uveitis); iris pigmentation changes; and macular edema, including cystoid macular edema (see WARNINGS and PRECAUTIONS). The ocular adverse events and ocular signs and symptoms reported in 5 to 15% of the patients on Latanoprost Ophthalmic Solution in the three 6-month, multi-center, double-masked, active-controlled trials were blurred vision, burning and stinging, conjunctival hyperemia, foreign body sensation, itching, increased pigmentation of the iris, and punctuate epithelial keratopathy. Local conjunctival hyperemia was observed; however, less than 1% of the patients treated with Latanoprost Ophthalmic Solution required discontinuation of therapy because of intolerance to conjunctival hyperemia. In addition to the above listed ocular events/signs and symptoms, the following were reported in 1 to 4% of the patients: dry eye, excessive tearing, eye pain, lid crusting, lid discomfort/pain, lid edema, lid erythema, and photophobia. The following events were reported in less than 1% of the patients: conjunctivitis, diplopia and discharge from the eye. During clinical studies, there were extremely rare reports of the following: retinal artery embolus, retinal detachment, and vitreous hemorrhage from diabetic retinopathy. The most common systemic adverse events seen with Latanoprost Ophthalmic Solution were upper respiratory tract infection/cold/flu, which occurred at a rate of approximately 4%. Chest pain/angina pectoris, muscle/joint/back pain, and rash/allergic skin reaction each occurred at a rate of 1 to 2%. The following events have been identified during postmarketing use of Latanoprost Ophthalmic Solution in clinical practice. Because they are reported voluntarily from a population of unknown size, estimates of frequency cannot be made. The events, which have been chosen for inclusion due to either their seriousness, frequency of reporting, possible causal connection to Latanoprost Ophthalmic Solution, or a combination of these factors, include: asthma and exacerbation of asthma; corneal edema and erosions; dyspnea; eyelash and vellus hair changes (increased length, thickness, pigmentation, and number); eyelid skin darkening; herpes keratitis; intraocular inflammation (iritis/uveitis); keratitis; macular edema, including cystoid macular edema; misdirected eyelashes sometimes resulting in eye irritation; dizziness, headache, and toxic epidermal necrolysis. Apart from ocular irritation and conjunctival or episcleral hyperemia, the ocular effects of latanoprost administered at high doses are not known. Intravenous administration of large doses of latanoprost in monkeys has been associated with transient bronchoconstriction; however, in 11 patients with bronchial asthma treated with latanoprost, bronchoconstriction was not induced. Intravenous infusion of up to 3 Î¼g/kg in healthy volunteers produced mean plasma concentrations 200 times higher than during clinical treatment and no adverse reactions were observed. Intravenous dosages of 5.5 to 10 Î¼g/kg caused abdominal pain, dizziness, fatigue, hot flushes, nausea and sweating. The recommended dosage is one drop (1.5 Î¼g) in the affected eye(s) once daily in the evening. If one dose is missed, treatment should continue with the next dose as normal. The dosage of latanoprost ophthalmic solution should not exceed once daily; the combined use of two or more prostaglandins, or prostaglandin analogs including latanoprost ophthalmic solution is not recommended. It has been shown that administration of these prostaglandin drug products more than once daily may decrease the intraocular pressure lowering effect or cause paradoxical elevations in IOP. Reduction of the intraocular pressure starts approximately 3 to 4 hours after administration and the maximum effect is reached after 8 to 12 hours. latanoprost ophthalmic solution may be used concomitantly with other topical ophthalmic drug products to lower intraocular pressure. If more than one topical ophthalmic drug is being used, the drugs should be administered at least five (5) minutes apart. Latanoprost Ophthalmic Solution is a clear, isotonic, buffered, preserved colorless solution of latanoprost 0.005% (50 Î¼g/mL). It is supplied as a 2.5 mL solution in a 4 mL low density polyethylene bottle with a low density polyethylene dropper tip, and a turquoise high density polypropylene screw cap.